Sometimes you have to see things for yourself. I had heard all the stories about Medellin’s scary and violent past and its (very recent) miraculous turn-around. I heard about the escalators, the flying cable car, and Medellin being named the most Innovative city in the world. And I heard about the UN hosting its 7th World Urban Forum in the “Spring City” just a few weeks before I arrived. Medellin is all the buzz in the urban and international development world for the reasons mentioned above. But what makes Medellin special isn’t in its buildings, public transit, or beautiful libraries. It’s in its people. Paisas (people from Medellin) have to be some of the most resilient people in the world. Medellin used to be the murder capital of the world with a homicide rate of 381 deaths per 100,000 people. Drug cartels and the gangs that work for them, ran the city, where many neighborhoods were off limits, even to the police! Now those same neighborhoods are becoming shining lights of inspiration, hope, and resilience and I was fortunate enough to witness some of it. Resilience is one of my favorite words and something I believe the world needs a lot more of. I am the President and Co-founder of an urban agriculture non-profit that teaches people all over the world how to sustain their communities through the use of space intensive vertical farming. Can YA Love was created with the intent of helping people meet their most basic necessities (like food) so that they can be more resilient when outside forces like droughts or financial speculation raise the cost of food. For billions of people, even a small increase in food prices can mean serious food insecurity. 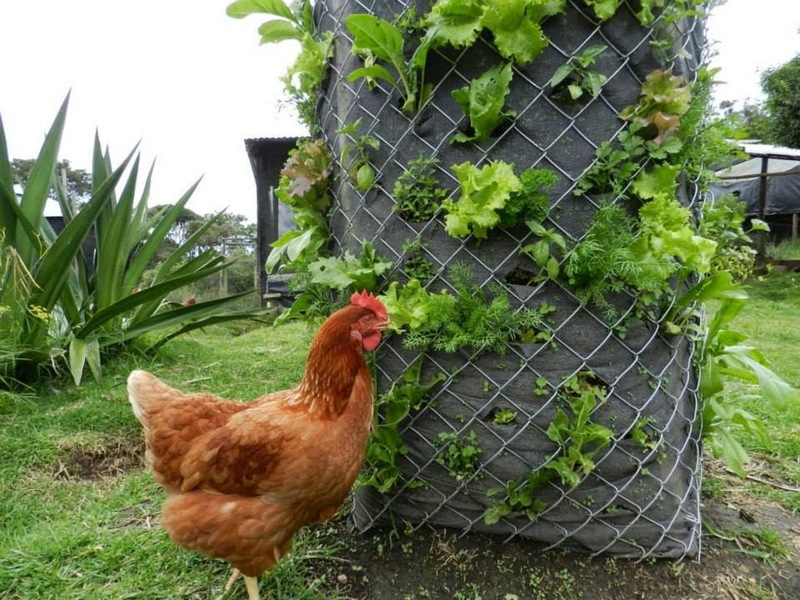 Can YA Love's vertical farms can be used in the most densely populated slums on Earth, are separate from the ground (which is often contaminated), can produce a lot of food in a little space, require less maintenance, and are accessible for the elderly and disabled. Can YA Love’s mission also includes using natural methods, aerobic composting, and sourcing local materials wherever we work. After learning of ACJ’s work around environmental sustainability and their ecological farm from my wife Terri, I saw an immediate synergy between the two organizations. With the help of many volunteers and staff from the YMCA of Greater Toronto and ACJ-YMCA Medellin, we were able to build two vertical farms in Colombia that are growing various types of leafy greens and herbs. 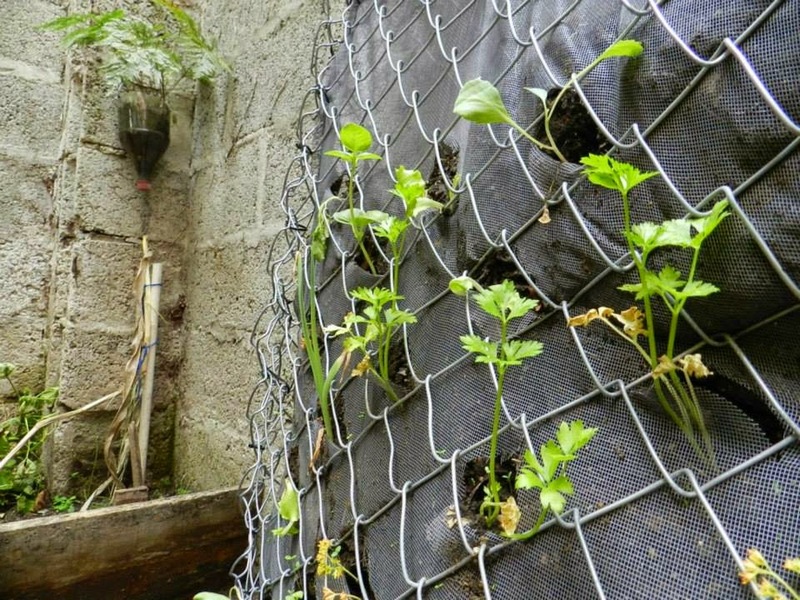 One is a “Growing Wall”, which we attached to a concrete wall at ACJ’s community centre in the city of Medellin. And the other is a “Growing Pillar”, a 5 foot tall cylinder that stands alone, at their farm about an hour outside of Medellin. The staff at ACJ are showing the vertical farm to visitors so that they can build their own versions back in the city where they live. This is exactly the effect we at Can YA Love want to have--a decentralized, autonomous, DIY movement around urban agriculture. From what I saw in Medellin, I am confident that we will be seeing some Pillars and Walls growing (pun intended) throughout the city. Growing Pillar at the farm, "La Selva"
more excited to see all the ways everyday people in Medellin work to improve their quality of life. I saw gardens and bricks made out of plastic, I saw young people starting gardens at their schools or right in the street, I saw young artists depicting the brutal reality of violence in street art, I saw hopeful teenagers using Hip Hop to spread a message of non-violence and positivity, I saw independent radio stations for the people and by the people, and in all these ventures I saw esperanza (hope) as the force that keeps them going. Resilience is the capacity to recover quickly from a challenging or difficult situation. After decades of violence in Medellin, this fancy word is just a way of life for Paisas. But it's more than violence that Paisas have had to deal with. There is not an adequate waste collection system in the city. This means there is lots of trash, particularly plastic, on the streets. Plastic takes hundreds to thousands of years to decompose and is made of toxic chemicals that are very harmful to the environment. Here in North America we send our plastic problem elsewhere...to a recycling facility or the landfill. We don't see the consequences of consuming so much plastic. But in many places in the world it is right in front of your eyes, everyday. To combat this problem, Paisas decided to use this abundant and free material to grow plants, to make art, and to use as bricks for landscaping. Although plastic is not the ideal material for any of these uses, the fact that it is free and abundant is a big advantage in a city where there are many people without other resources. Gardens made out of plastic bottles by La Morada aka "The Purple House"
One more example of resilience before I close. Myself, Coel from the YMCA GTA and Cesar from ACJ-Medellin, went to visit an independent radio station in Medellin’s Comuna 4. The station was small but what struck me was how nice and new all the equipment looked. The booth where the DJ was working had soundproofed walls, brand new microphones, two computers (and two radio stations) going simultaneously, and lots of other cool looking gear. The DJ and founder of the station told us its history. En Lace, is an online radio station that plays strictly Hip Hop. But what was interesting to me, was it didn't start out that way. It started out as a community station that transmitted over the airwaves like your average radio station. The station primarily focused on the issues of Comuna 4 and often times asked people to call in to help decide music selection and decisions for the station as a whole. The staff behind the station (which had a different name at the time) were all volunteers. It was a radio station that was needed in the community and the community respected it. But by the time we visited, the station had been financially prohibited from transmitting over the airwaves, had gone through different names, and even had a different business model. Apparently, the station needed to pay some kind of licensing fee to the city, and when the big radio stations heard they hadn't, they were shut down. But here we were standing in the studio, talking to the founder. Coel on the left, me on the right. With the help of another radio station (from Chile I think), a different business model (now strictly online), some startup funds from the city's innovative social budget, and the community itself, a radio station was up and running again. I thought this was another beautiful example of the resilience and determination I witnessed in the people of Medellin. They have the best kind of hope you could ask for. A hope that is backed up with action. If only we could all follow this example, we'd have a much better world.